Homemade Assorted Chocolates in Thali with free silver plated coin. 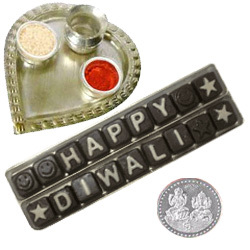 Gift this Happy Diwali Silver Plated Paan Shaped Puja Aarti Thali (52 gms) with Homemade Assorted Chocolates Gift Pack containing 18 pcs of yummy chocolate with free Silver Plated Lakshmi Ganesh coin. Note:Thali Size: 5"-7" inch.